You know what I miss the most about Hong Kong? It’s not the mesmerising night scenery from Victoria Peak, it is all the delicious food. 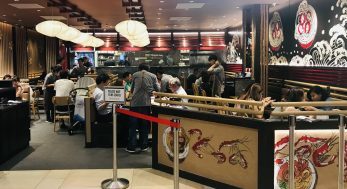 Many of these famous Hong Kong eateries have set up branches in Singapore, from Tai Cheong Bakery to Tim Ho Wan. 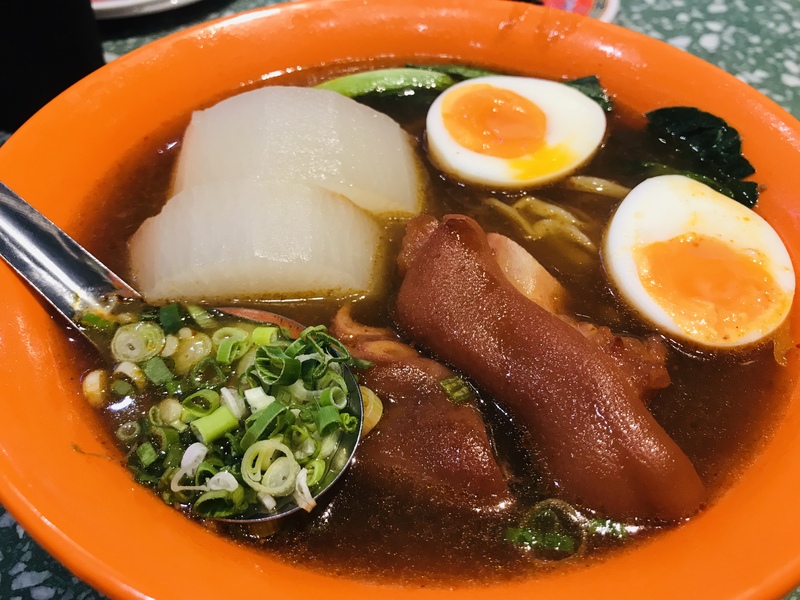 There are still many Hong Kong delicacies that have not made it to Singapore yet, one of which is Hong Kong cart noodles. 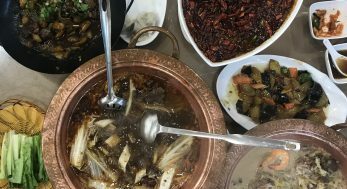 If you have the misconception that cart noodles is simply instant noodles with a variety of ingredients, you are not alone. That was what I thought too, until I had my first bowl of Hong Kong cart noodles at Mian Mian Dian. My whole perception on Hong Kong cart noodles changed and I fell in love with Hong Kong cart noodles. 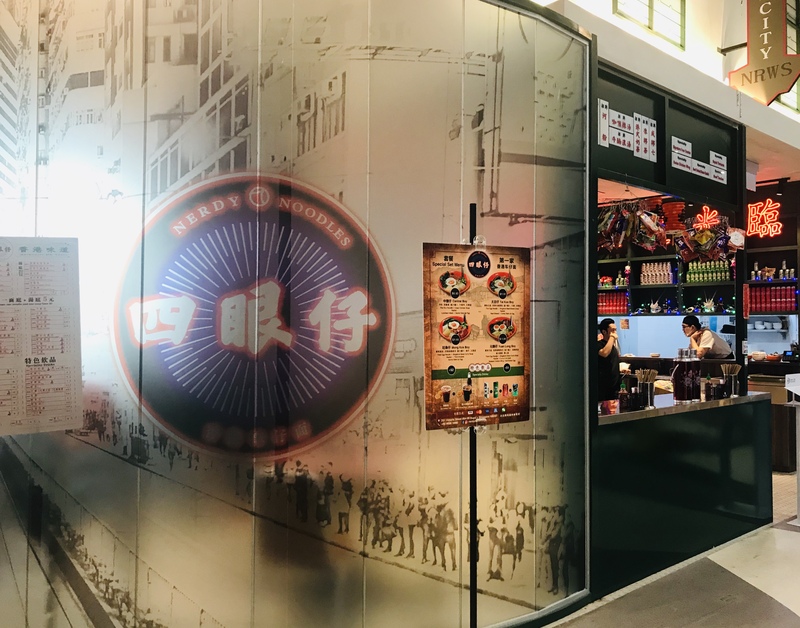 I chanced upon this restaurant in Bugis + called Nerdy Noodles (四眼仔). Even the restaurant name sounds Hong Kong, that’s a good sign. 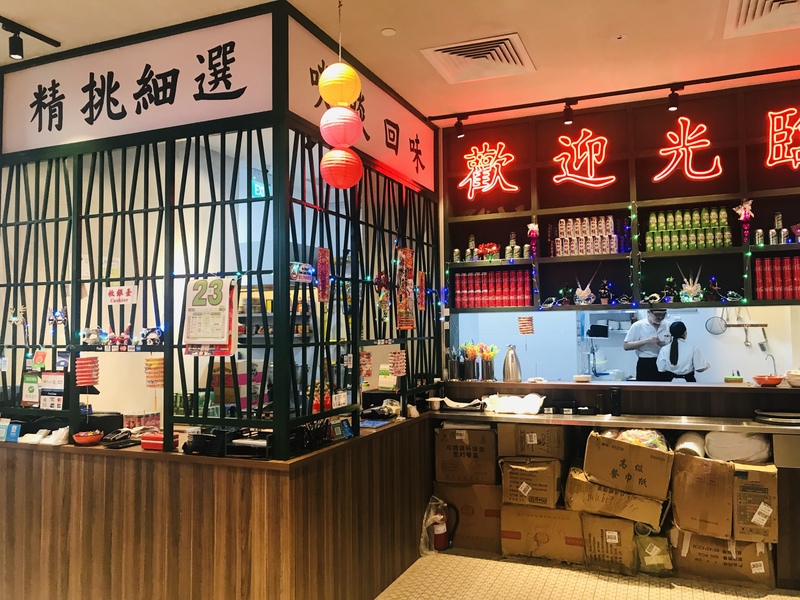 I restaurant is decorated to resemble an old-school Hong Kong restaurant in the 1980s. Patterned floor tiles cover the floor and there are even neon signs on the pillar. Green and red patterned tables are complimented by brown padded stainless-steel chairs. Surrounded by such detailed decorations, it is not hard to imagine you are really in an old-school Hong Kong cart noodle restaurant. You can customise everything about your noodles in Nerdy Noodles, from the noodle, soup base to the toppings (at least 3 toppings). 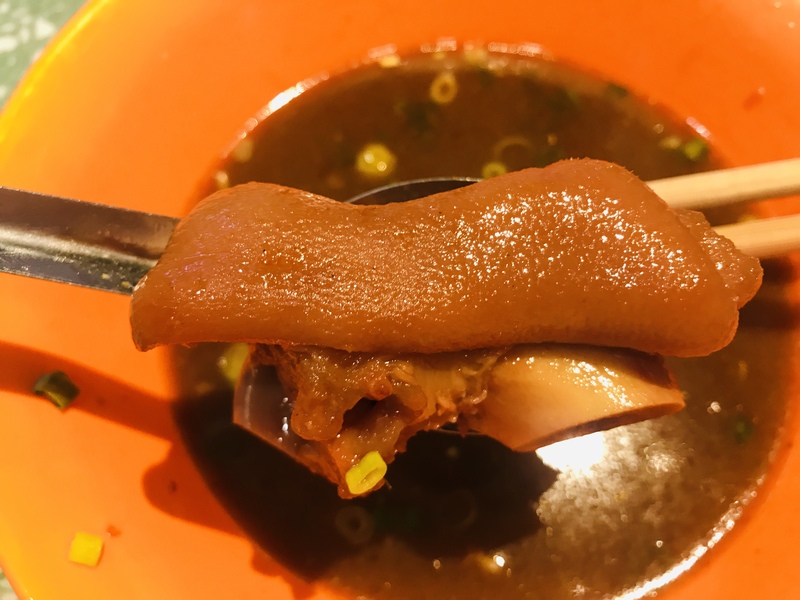 There are 6 soup bases to choose from – Signature Spicy Curry Soup, Signature Beef Brisket Soup, Marinated Soup, Clear Beef Bone Soup, Clear Chicken Soup and Clear Beef Brisket Soup. 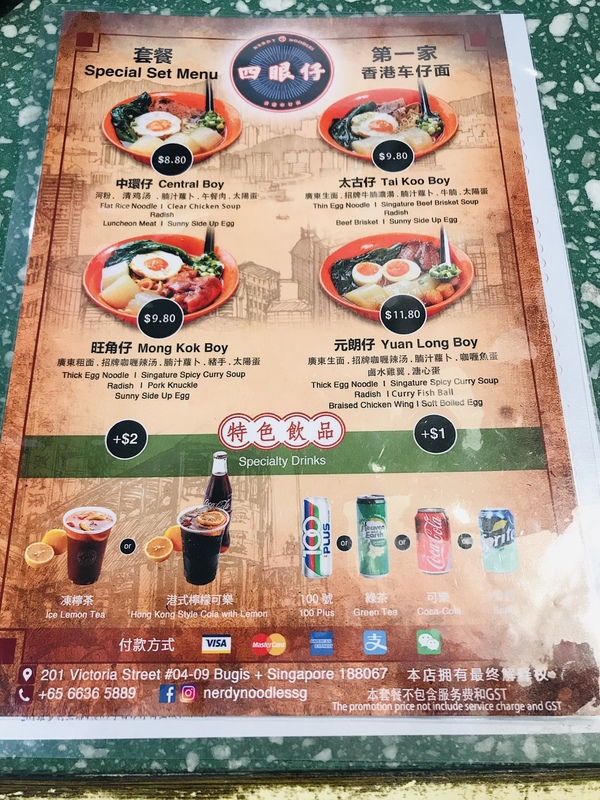 You can choose from 7 noodles – Thin Egg Noodle, Hokkien Noodle, Flat Rice Noodle, Rice Vermicelli, Thin Rice Noodle, Thick Egg Noodle and Nissin Noodle (instant noodle). 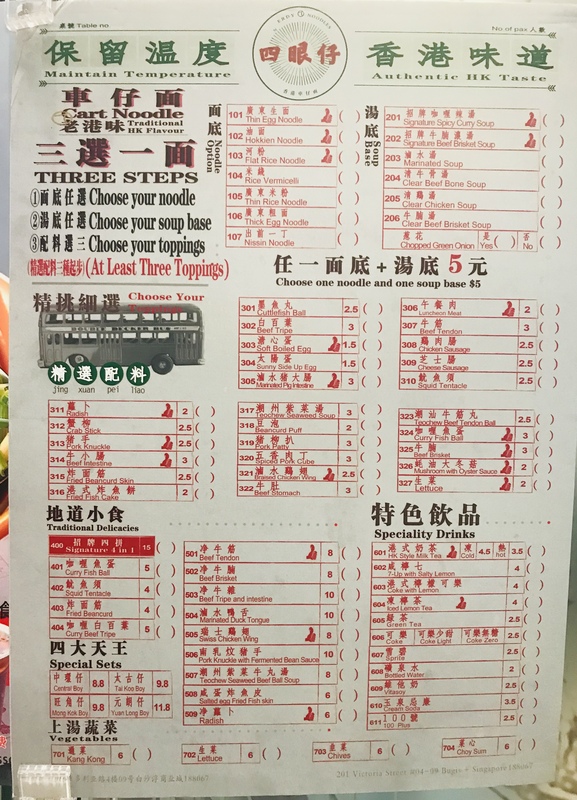 There are 40 toppings to choose from, all the cart noodle favourites can be found here. If you are lazy to customise everything by yourself, you can always order from the Special Set Menu. 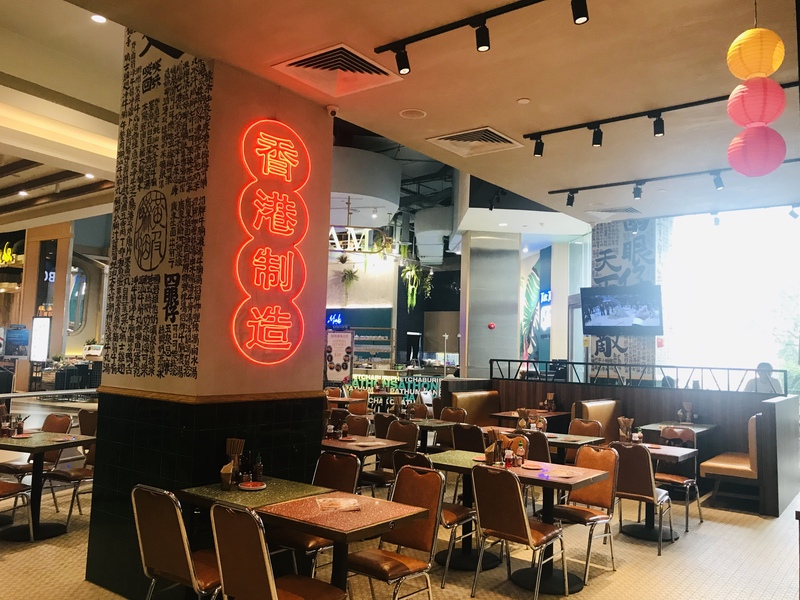 There are four pre-curated noodle creations to choose from, each named after an area in Hong Kong. 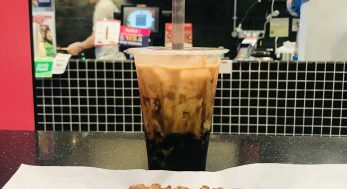 This is Tai Koo Boy [$9.80]. 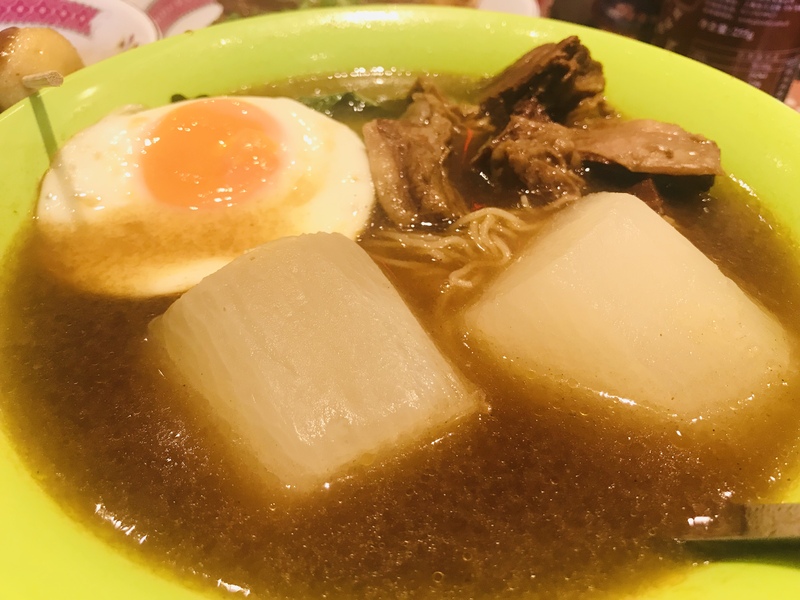 Signature Beef Brisket Soup is paired with Thin Egg Noodle, Radish, Beef Brisket and Sunny Side Up Egg. There is too much fats on the beef brisket and not as tender as I would have liked it. This is Mong Kok Boy [$9.80]. 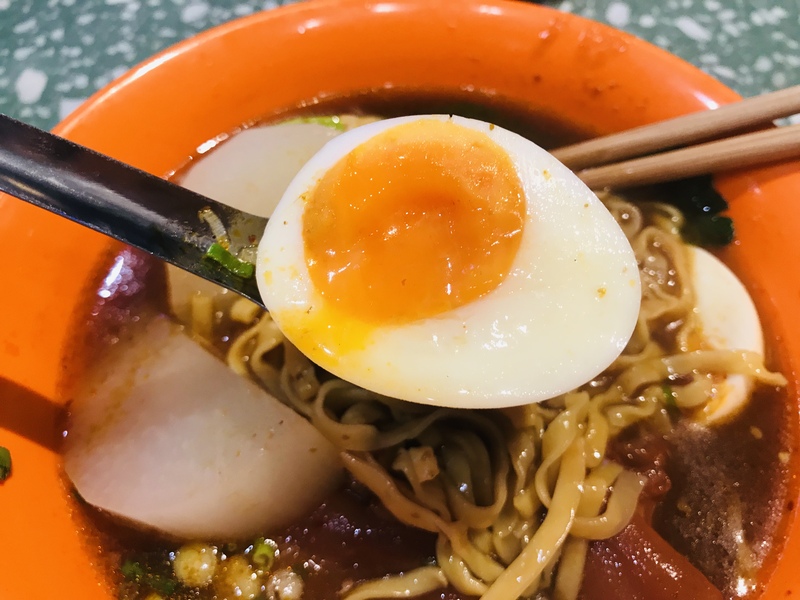 Signature Spicy Curry Soup is paired with Thick Egg Noodle, Radish, Pork Knuckle and Sunny Side Up Egg (I changed it to Soft Boiled Egg). 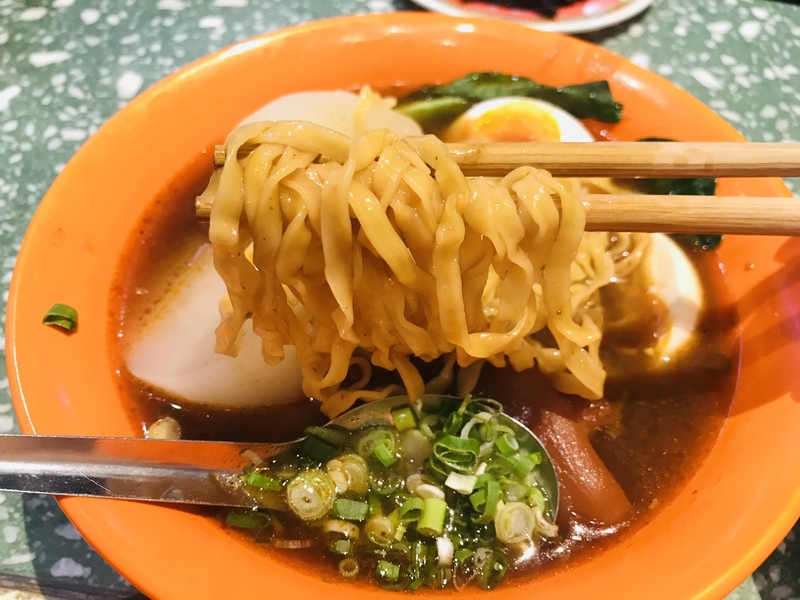 The curry soup is not too spicy and thick egg noodle goes really well with the curry soup. The pork knuckle is so good, not at all greasy. Nerdy Noodles also serve four traditional delicacies and I tried two of them. The top picture is Fried Beancurd Skin [$4] and the one below is Curry Fish Ball [$5]. 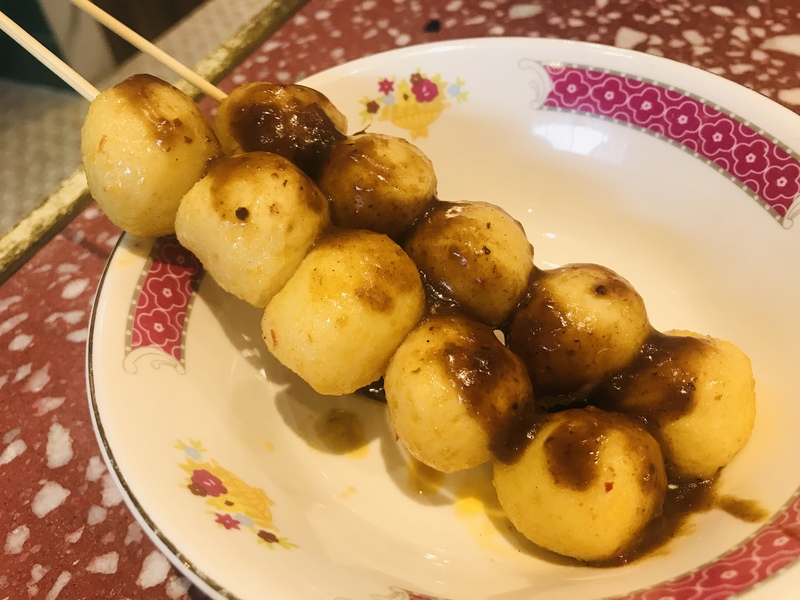 Hong Kong fish balls are different from the fishballs that we are used to eating in Singapore. Hong Kong fish balls are smaller and have more “crunch”. If this is your first visit, I would suggest getting the Fried Beancurd Skin, as this is a Hong Kong snack not commonly found in Singapore. 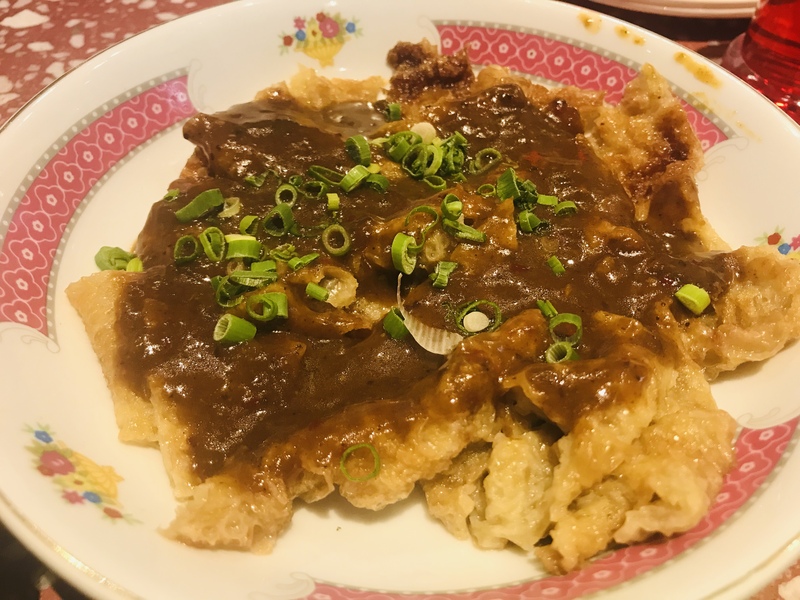 The curry sauce used is the same for both, or you can always get the Signature 4 in 1 [$15]. 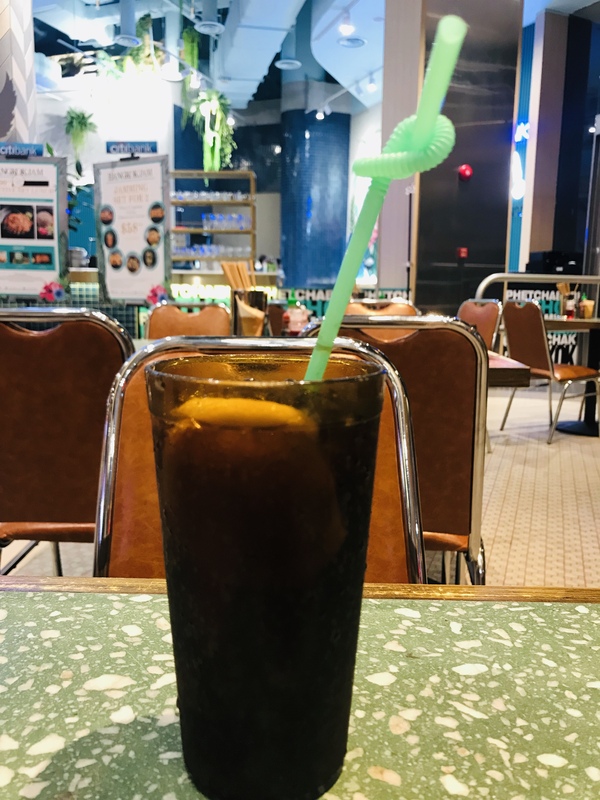 Most Singaporeans should be quite familiar with HK Style Milk Tea [$4.50 for Cold, $3.50 for Hot], I decided to try something different – Coke with Lemon [$4]. This is a popular drink especially during the olden days in Hong Kong. Don’t expect anything extraordinary, it is just as its name says – Coke with a slice of lemon. Nerdy Noodles has become my go-to place whenever I am craving for Hong Kong cart noodles. With 6 soup bases, 7 noodles and 40 toppings to choose from, the combinations are endless.